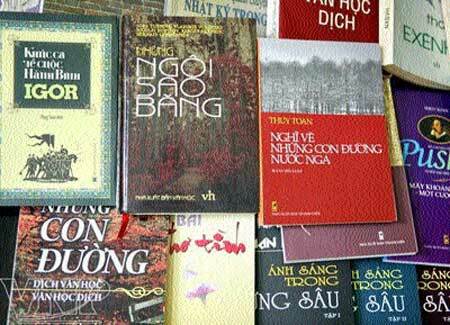 Prolific: Thuy Toan has translated hundreds of books from Russian to Vietnamese and Vietnamese to Russian. Hoang Thuy Toan aspires to build a cultural bridge between Viet Nam and Russia by translating the works of great Russian poets. The 76-year-old in the northern province of Bac Ninh's Phu Luu Village specialises in Alexander Pushkin's poetry. "He translates so well that I can learn a poem by heart very quickly. But more importantly, I can learn about Russian poetry through his translations," said writer Nguyen Van Toai. After graduating from the Literature Department of the Lenin Pedagogy University in Moscow in 1961, Toan devoted his life to translating Russian poetry. Russian literature arrived in Viet Nam before the August Revolution in 1945 and became popular in the 1950s through translations by literary critic and writer Vu Ngoc Phan and poet Hoang Trung Thong as well as many others. Toan composed many poems and stories published in Vietnamese and Russian newspapers, but he felt his compositions were "dim" compared with those by Russian writers. The idea came to him to translate Russian poems into Vietnamese so those who didn't know Russian could enjoy them. By his fourth year at the Russian university, Toan had translated many Pushkin's poems and sent them to the Literature Publishing House. The excellent penmanship of the translations made people think they were written by a female. "I asked my girlfriend (now my wife) to help me write my translated poems," Toan recalled. He translated about 70 poems by the author, devoting himself wholeheartedly to each. Writer Toai said that through Toan's translation he could sense a patriotic atmosphere and thirst for freedom, as well as a fierce and immense concealed sadness. "When reminded of Pushkin, Vietnamese readers think of Thuy Toan," he said. The poems translated by Toan as well as famous poets Xuan Dieu, Hoang Trung Thong and Te Hanh helped Vietnamese understand Russian literature, he added. Toan typically spends one night to translate a poem, although he has sometimes done three in a night. But one poem, A Winter Morning, took 30 years. In 1956, he was among 20 students chosen to attend university in Russia. During the winter holiday, a young teacher took students on a skiing trip. Winter in Russia was "wildly beautiful and strange", he recalled, with "immense hills and mountains covered in white snow" and "forests where some trees were bare and other pine trees were still green." 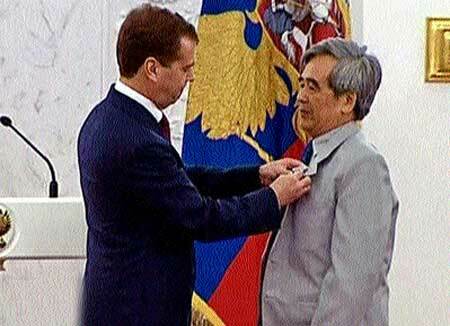 Rewarding work: President Dmitry Medvedev presented Toan with the Russian Friendship medal in 2010. The teacher read the poem A Winter Morning in a very expressive voice, making him immediately take notice. That night, he took out his dictionary and tried to translate it to Vietnamese. "But I got stuck on the poem's first sentence. I spent the whole night thinking about it," said Toan. Later he had translated many Pushkin's poems, but A Winter Morning was still not finished, although he "understood its soul". For that reason, the poem did not appear in his first book, Pushkin's Romantic Poems, printed by the Literature Publishing House in 1966. In 1987 on the 150th death anniversary of the poet, he felt a deep longing for Russian winter and each word from the poem suddenly made sense. Reading his translated poems also made those who once studies and lived in Russia feel nostalgic for its winters, said Toai. Toan had to learn ancient Russian and collect more than 20 different modern Russian editions to translate the collection The Song of Igor's Campaign, an Epic of Twelfth Century, a very difficult work that could push a translator to the edge of failure. "I worked very hard month after month to convey the soul of the work in Vietnamese," he said. He has translated hundreds of Russian and Vietnamese books, written hundreds of newspaper articles in Russian and Vietnamese and held five exhibitions displaying Russian literature objects at culture centres in Ha Noi. In 2010 he was honoured to be received by President Dmitry Medvedev, who presented him with a Friendship Medal in the Kremlin Palace. He hopes to build a Russian Literature Commemorative House in his native village of Phu Luu.